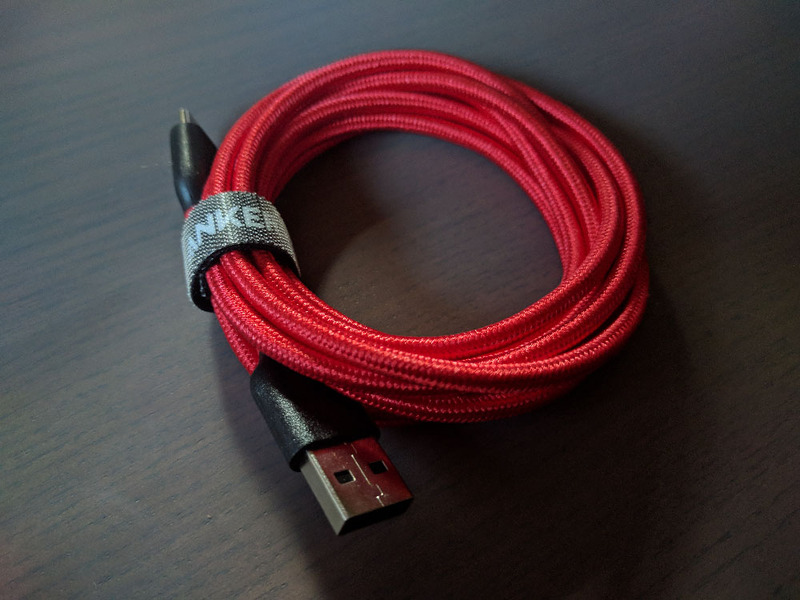 I was recently given a sample of Anker’s new 6ft USB-C to USB A cable (They also come in a 3 foot variant). Actually, I guess I should say that I was given two samples, since they come in a pack. I’ve been using them over the past week and a half, and I’ve got to say, I’m very impressed. Granted, I think you could successfully classify me as an Anker fanboy, because I love pretty much every single one of their products that I have. These cables are no exception. The nylon wrapping is awesome – to me it seems far superior to just a rubber cable. It’s more durable, it’s super flexible, and it really feels like it’s built to last. The connections at the end are sturdy and they hold well when plugged in to both my phone and my charger/computer. Finally, the red color on the nylon wrap looks pretty cool. It looks a lot nicer than either a plain black or plain white cable, and I think it’ll look a lot better when dirty than rubber white cables do. I think my only complaint about the nylon wrap would be that I think it’d tend to fray a bit over time. Since I haven’t had these cables for very long, I can’t say whether or not that’ll actually happen, just that it seems likely. Of course, even if it does happen, it’d be easy enough to clean them up with a quick pass of a lighter. Overall, these are another great product in Anker’s lineup. I’m looking forward to using them for at least the next few years.